We Can Repair Any Appliance! No broken appliance is match for our team of certified super-technicians. We can repair any stove, cooktop, oven, range, refrigerator, freezer, microwave, dishwasher, washer, dryer, ice maker, air conditioner, heater, disposal, water heater or any other type of commercial or residential appliance. 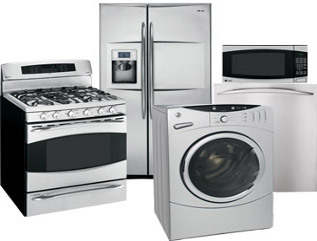 No appliance repair company services more brands than Appliance Repair Santa Monica! We service any appliance made by Admiral, Amana, American Standard, ASKO, Bosch, Brown, Dacor, Frigidaire, Gaffers and Sattler, Gaggenau, GE, Gibson, Hampton Bay, Hotpoint, Kenmore, Kitchen Aid, LG, Magic Chef, Maytag, Modern Maid, Montgomery Wards, Norge, O’Keefe and Merritt, Samsung, Sanyo, Sears Signature, Speed Queen, Sub Zero, Thermador, U-line (Uline), Viking, Westinghouse, Whirlpool, Wolf, and more. Our qualified repairmen come to your residence or commercial building at a time that is most convenient for you. We are available at any time of the day, during any day of the week. By traveling to you, we are already saving you time and money by eliminating your gas expanses (and possible medical bills) associated with delivering your broken appliance to us. You can avoid unnecessary expenses by calling us first. Fixing mistakes done by other technicians or by DIY repairmen will also be included in the bill. We can travel anywhere in Los Angeles and San Fernando Valley with no extra charge.We also offer service in bakersfield and the surrounding Kern county for appliance repair. There is no service charge with repair. You are especially in luck if you are located in Santa Monica, Brentwood, Bel-Air, Westwood, Venice, Marina Del Rey, Pacific Palisades, Beverly Hills, Winnetka and West Hollywood. All of Los Angeles and Orange County is in our reach at any time that is convenient for you. For appliance repair los angeles call us today and get a free service call with repair.